The last bit o' penguin fun! Here's the last bit of penguin fun that I have up my sleeve. What could it be? I like to call this "Funky Penguins" art! Gather yer supplies. Each kidlet will use one piece of black paper. Have your wee ones (or you, if they are a bit small) fold paper in half creating a crease down the center. You can do this in either direction but width wise will leave you with a bit more room for the paint to ooze. Next up, your kidlets will drip or squeeze bits of paint on one side of the paper near the crease. Kind of like that old fashioned butterfly art we used to do as kids only we're using white and yellow paint. Once they've dripped to their hearts' content have them fold the paper back in half and rub a little to spread the paint. This part can get messy so have fun! Open the paper to reveal their masterpieces and add bits of glitter to the wet paint. Set aside to dry. Once dry your wee one's can cut out a penguin shape, add eyes, beak and feet using scraps from the black paper and a cupcake liner or construction paper for the beak and feet. Use a glue stick or glue to stick everything on and VIOLA, funky penguins for everyone! So, have ya hunted through yer casa for penguin colored supplies? The easiest project to do is to make a penguin inspired colalge. This is one all kidlets can make. It is pure creativity. Check it out! *odds and ends in the penguin colors like felt, fabric scraps, tissue, pipe cleaners, glitter, etc. Set out yer splat mats, cover up any must cover clothing, roll up sleeves and have a go! If your wee ones lile a lot of paint nd glue, go for some sturdier paper. Paper plates are awesome for this. Set their collages somewhere safe fro drying. Once they are dry you can transfrom them into many things! Refrigerator art isn't the only thing. Frame them, hang them, cut them up for more fun. Let your kidlets guide you and have fun! Okay, so, Penguin Day was yesterday and I am late with some penguin inspired projects. I am so sorry for that and I have some projects about to be done but for now I leave you with Chalky Penguins! The nifty thing about penguin inspired art is that you don't need too many colors and in looking for what you have on hand you just may come up with something completely original and super duper fun! To start all you have to do is go on an art supply scavenger hunt and search your household for black, white and yellow. The possibilities are endless! You could even send your kidelts on the hunt with guidelines, of course! 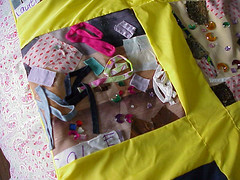 Fabric scraps, paper, newspaper, paint, crayons, dried pasta, rice, black beans, pip cleaners, tissue...see what I mean. Today's project utilizes those fun and chunky bits of sidewalk chalk that are laying about. I don't know aboutany of you but when we have a new box of sidewalk chalk in this place, the blues and pinks and greens get snatched up right quick but the whites and yellows usually sadly linger in the bottom of the tub. 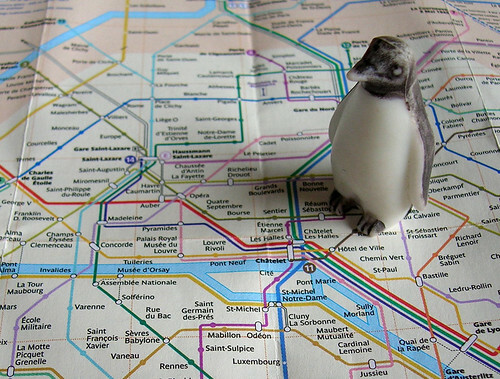 Pull them out, shake them off and have a go at some Penguin drawing. If you are super industrious you can make your own sidewalk chalk. If you're feeling click happy you can check out my newest kaboodle list! Pips in Paris..., originally uploaded by aldine. It's raining outside this morning and I think perhaps a nice indoor, quiet, no mess art activity would be great for today. Still have a pile of nice shiny coins from earlier this week? Do they still smell like ketchup? Well, dump out your coin purse, jar or whathaveyou and have your wee ones make some coin rubbings! You could do this on regular printer paper and cut for cards or you can try this using large sweeps of paper to make custom gift wrap or you may even want to do this with tracing paper and turn their art into suncatchers of a sort. The thinner the paper the better the rub! The easy way would be to toss a handful of coins onto the tray or cookiesheet, place paper over and rub. This is great for kidlets 7 and up. Wee-er ones (say 4-7)may get frustrated with the coins moving all over the place. For them I would add a small ball of play-doh to one side of each coin and have your kidlet pres the mdown onto theur work surface. The dough should stick just enough to act as an anchor. Place sheet over the coins and tape down the top edge. Place crayon lenghtwise onto paper and rub, rub, rub away! Coins, colors and paper can all be shifted and moved about to produce a super nifty picture! When that gets old, your kidlets may enjoy pressing their coins into the dough to see the imprints they leave. Play the compare and contrast game, sort the coins by likeness, make charts, have fun! 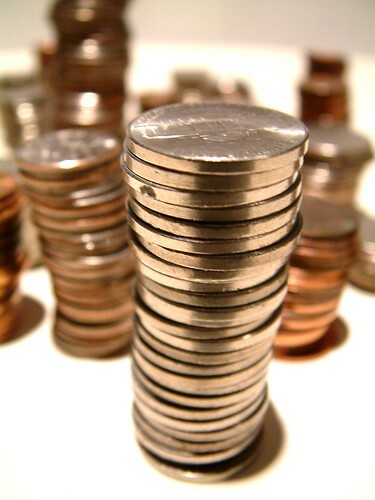 Don't forget to check out my book list and my fun list, they;re all about fun with coins! Happy Friday folks! What? This is a messy fun activity to do with your wee ones who know not to put pennies in their mouths! You can read all about the science of it here. What could be more fun than being allowed to play with ketchup? If you're lucky, your wee ones will be entertained for maybe thirty minutes. It depends on how many pennies you have, your kidlet and their tolerance for mess and/or ketchup. You can also use taco sauce, lemon juice or vinegar but I think ketchup has the most mess factor which usually equals fun in any wee one's book. Wash your pennies first so you won't freak out when your kidlets start snacking on their fingers. I like to put all the pennies in a container with a lid, add warm soapy water, seal and shake. Rinse until all soap is gone and viola, clean coins. Kidlets may even like doing this part. Squirt a bunch of ketchup onto your work surface, add pennies and let them sit for at least 2 minutes to get the vinegar in the ketchup to start working on the copper oxide. Hand yer wee ones a toothbrush and let them scrub scrub scrub away. Toss the pennies back into the washing container, rinse and you're done! Viola! Clean pennies! If you can get your wee ones into it, and they can read dates, have them sort the pennies by year and make a chart or graph. I've entertained other kidlets by having them use the coins as "blocks". They built some pretty interesting structures with pennies and other found objects. Ooh, don't forget this puzzle for your whole family! Have fun and happy washing! Nickels!, originally uploaded by "Mr. W". Here's a list I put together just for you. It is chock full of tips for teaching your kidlet's the value of a dollar. It is also oozing with rich illustrated texts! Have a looksie and start saving! So sorry to not have anything new up folks1 I've got midterms and a camping trip coming up so things are extra busy here at the A-go-go household! So, for now I bring to you a list of all my book lists so far. Have fun click click clicking away when you have the time and see if your libraries have any of these super nifty picture books! Sorry folks, I have no Easter egg activities to offer you for I feel that it is a bit obvious! What I DO have is a shout out for my favorite childhood book, a listmania list for books and a kaboodle list for fun! This was a book of the month book. My mother somehow managed to set me up with a new book each month that came in the mail just for me! Whoo-hoo! It was very exciting and oh how I loved the mailman when he had a package for me. How Fletcher was Hatched stuck with me for years and years and years. Only a shadow of the story stuck with me but the pictures...THE PICTURES resided in my brain for years and years and years! 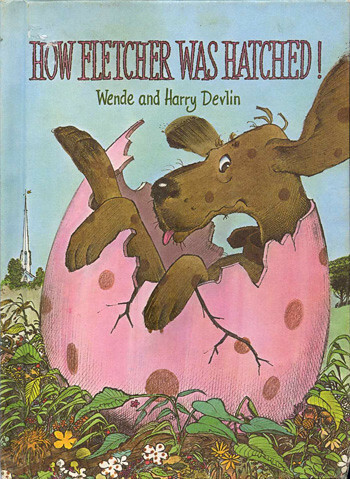 I couldn't remember the title but I knew it was about a dog that hatched from a giant pink polka dotted egg. One day about 10 years ago I was working in the bookstore when one of my favorite kidelts came in yammering in her thwee yeaw owd voice about the book wid da doggy named Fwetcha and it hit me! I was so excited! Turns out her preschool had a copy and since her family had a hound dog she was really intent on keeping the book but she couldn't because it belonged to the school. Finally, I had the title! I kept my eye out for it and one day I told my favorite librarian customer about it and she came in a week later with the book! For me! I had Fletcher! Then, the day after (I swear!) my mother called to tell me she found my copy with the shoe polish all over the front and my backwards name scribbled on the inside! I now had two copies and could give one to little Savannah! The story is about a hound dog named Fletcher who fears his mistress doesn't love him anymore because she keeps playing with the new baby chicks. He runs away and runs into two beavers who build an egg around him so that he could win back Alexandra's adoration. Suddenly there is a giant pink egg in the middle of town! Oh what fun! This story is so delightful and the good news is I have a copy for giveaway! If you are interested, leave me a comment and I will put yer names in an egg and see who becomes the owner! It could be you! Ceck out this nifty sidewalk chalk activity from skip to my lou Have a great holiday weekend folks! How's about some gardening fun? Someone out there in the big wide world has declared April National Gardening Month so why not take advantage of it and have yer wee one's grow something! You can pick up seed packs just about anywhere these days. From the supermarket to the dollar store to one of the big box "we sell everything" stores, seed packs should be easy and inexpensive to find. You can even throw a garden party if yer wee one was lucky enough to be born in the spring. So many ideas, where shall I start? *sprout an avocado pit (and yer kidlets can make some guacamole also! Or if you would rather go with something a bit more fruitful you can purchase small strawberry or tomato plants for yer wee ones to nurture and grow. One single strawberry has never tasted sooooo good! Now is a good time if you are in the states. I'm a bit of a dunce when it comes to geography but I am sure there is something out there for every kidlet to grow no matter the amount of sun you are getting unless of course the sun is hibernating for you right now. For you I have included a list of excellent and fun picture books. If fruits and vegetables are not up your alley, you can always grow flowers. Pick an easy to grow variety like violas or cosmos. Violas are perfect for little pots on the windowsill. A windowsill garden would be perfect for your tot! They even sell teeny tiny pots that she or he can paint and decorate. A handpainted pot with a custom pack of seeds makes for a beautiful gift for a family member at this time of year. You can purchase small envies from a specialty paper store or you can make your own with this template here. Turn your wee one's artwork into a custom pack of seeds! See? Too many ideas! You can take your kidlets out to see public gardens in action. From Museums to Community Gardens to your neighbor's front yard, I am sure there is no end to the plantlife in your neighborhood! Don't forget to make a masking tape bracelet to catch all those pretty leaves and petals that have fallen to the ground! And to top it all of check out this kaboodle list for more garden inspired fun! Thank you for stopping by! 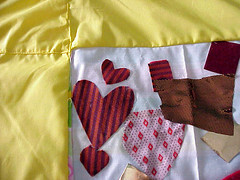 Or a family quilt, you decide whichever works for you! 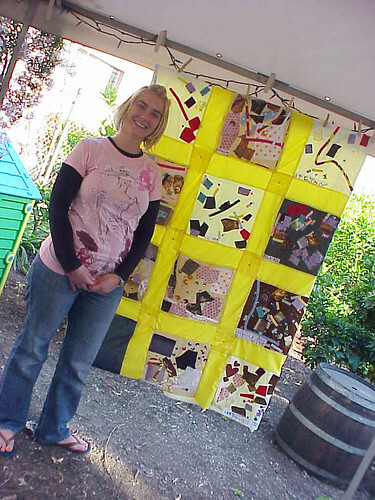 My good friend and Reggio educater Julia put together a classroom quilt to be raffled of at her preschool fundraiser. She had each kidlet in her class art up a square that she then pieced together to make a wall quilt. This is more awesome than awesome! 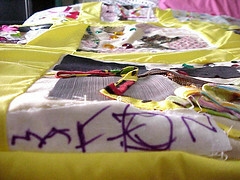 The coolest part is that all the documentation on how they worked on their quilt will also be included in the prize! Isn't that neato keen?